Live life like you got one to live! getting/being old is boring. be young! Some say that Humor comes from the suffering of others, but I’d say it’s a matter of Contrast, & this comic is the Perfect example. 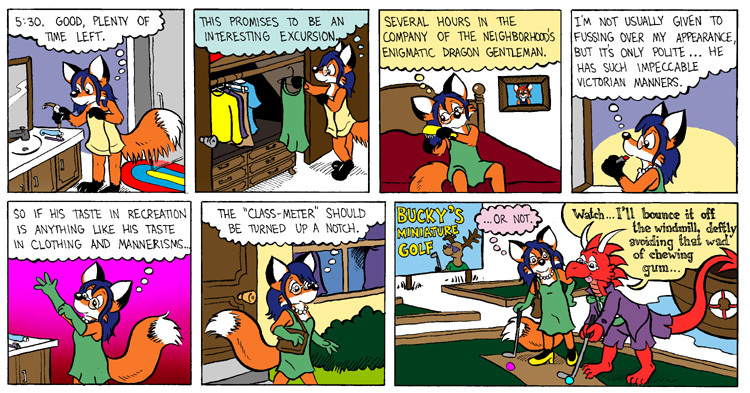 Heh, The mini golf course is owned by a buck named Bucky. Does it only cost a buck to play? Is it popular with chickens and broncos? With background music by Buck Owens and the Buckaroos! And the slogan “Don’t pass the buck, come and play”? I’ve played a couple games of mini-golf. The last one was at a course my opponent said was the worst maintained mini-golf course I’ll ever see. I think I scored something like 150 or more.